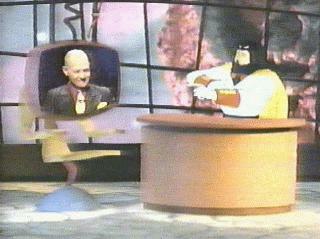 The Millionaire on "Space Ghost: Coast to Coast"
Luxuria Music sadly is no more (it was bought and shut down by media giant Clear Channel Communications), but that's no reason for this tribute to "The Millionaire" (whipped up by the TTM webmaster) to go to waste. The Millionaire is one of Luxuria's creators, and a member of the hip combo, "Combustible Edison". I was put onto this unique web site by another former Luxuria host, Jack Diamond, who plays a part in a story on the Fantastic Theater page. Bulletin, 11/5/2002: LuxuriaMusic is making a comeback. 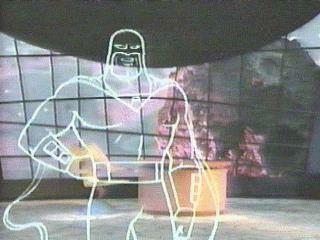 Moltar: Game on, here's the ghost. 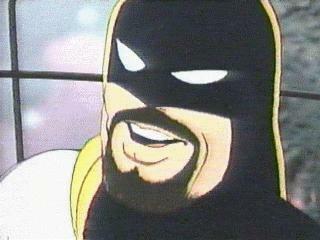 Zorak: Space Ghost's evil twin brother Chad?! Chad Ghostal: The asylum? Don't you wish! I blew that popsicle stand to make the scene here, baby. 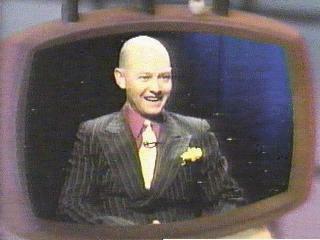 So dig it, kids, Chad Ghostal's takin' over! Zorak: But why take this show over, it stinks! 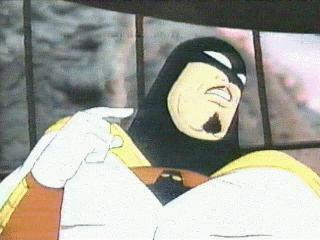 Zorak: But, what about Space Ghost? Chad Ghostal: Oh, don't worry about the Tadpole, he's gone, man. Real gone! 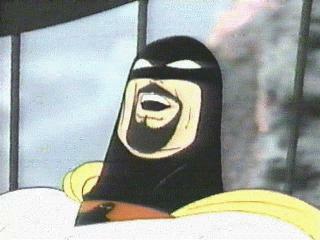 Zorak: You mean... you destroyed Space Ghost? Chad Ghostal: Let's just say my brother Tad won't be with us tonight.Ya dig? 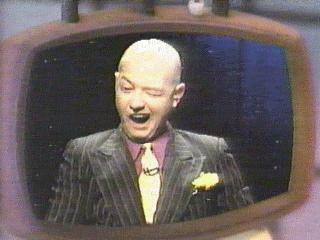 Chad Ghostal: Tonight we do things my way, cats. No 70's sitcom rejects, no MTV snot-noses, we're gonna wig out and get evil tonight, baby. (big band music in background) My guests tonight are The Millionaire from the sharp music combo Combustible Edison. And direct from Vegas, legendary band leader hepcat Sam Butera. (applause in background) Pow pow pow, go cats, go! The Millionaire: (on monitor as it lowers) I am The Millionaire, from the pop combo Combustible Edison. Zorak: He looks like a Batman villain. Chad Ghostal: Man, your dry goods are murder! Clue me in on the threads. Zorak: Ten bucks says Louie the Lilac. Chad Ghostal: Ow! I'm wise! So, who inspires The Millionaire's style? Zorak: (in Batmantis costume) What's this? Has Batmantis been gypped out of ten bucks? Chad Ghostal: Don't be a bore. Chad Ghostal: So, Millionaire, for the benefit of my brother's icky sidekicks, what is 'hip'? The Millionaire: Don't ask me, I'm only a mere mortal. Chad Ghostal: Deaf lip, my man. Well then, what's not hip? The Millionaire: Uh, Dockers. That's one thing. The Millionaire: (laughs) Really, you don't say. Chad Ghostal: My brother's a total Clyde, baby. Uptight! Chad Ghostal: He's a drag. But I took care of him, in style! 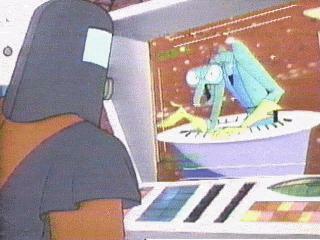 Zorak: Show us the body! Moltar: Is he.. still in one piece? The Millionaire: So, do the buttons on your gauntlet do something entirely different than his, I've always wondered about that. Chad Ghostal: Oh, you know it, Dad. The Millionaire: What do yours do? The Millionaire: One of them must dim the lights on your chamber. The Millionaire: That's a good one. Chad Ghostal: You know it, baby. (does cat growl sound) (sound of girls sighing again) (lights return to normal) So, any last words of advice for our lonely little viewers? The Millionaire: Stay fabulous, beautiful people. Have faith, don't let the man beat you down. Chad Ghostal: Awright! Listen, my main queen Elvira's throwin' a blast tonight, wanna swing by? Chad Ghostal: Thanks for droppin' by, Millionaire. See you tonight. 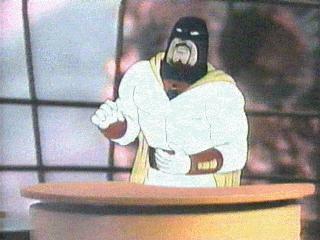 Zorak: Now will you tell us what you did with Space Ghost? Chad Ghostal: You know, Zorak, curiosity killed the uncool cat. You dig? Moltar: (dances) Da da da da daaa, da! Chad Ghostal: (dances) (does wolf howl), baby!! Take five, kids. Catch you on the flip side! 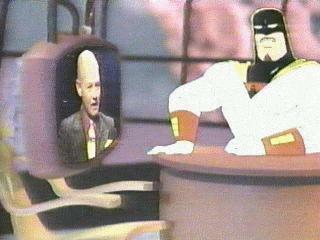 "Space Ghost: Coast To Coast" may currently (11/2003) be seen on the Cartoon Network Sunday at 10:30 pm CST.